Aarush Devcon shines bright on the real estate canvas of Central India. The group has always combined healthy living with construction. Nature and development come on the same page on the dictionary of Aarush Devcon. Aarush Devcon is an Indore-based company that has always emphasized on better living with better planning, better construction at most affordable price in every project. Aarush Devcon has made its presence in residential campuses and colony projects in since a decade. It has always combined greenery with building. The group believes in living in a healthy and eco-friendly way.Each project constructed by Aarush Devcon has kept high standards of environment close. Aarush Devcon has sparked a quality revolution in the real estate sector by following quality parameters of its own. The group boasts of projects that have re-defined construction business apart from creating landmark edifices. 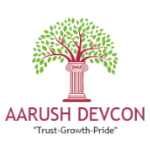 Aarush Devcon has successfully earned the trust of many consumers through building and dependable dwellings.Aarush Devcon has made its presence felt in construction of houses, apartments and townships. The group is equipped with the best of brains in the industry and the most loyal team to deliver the best every single time. The group has been very creative in designing buildings that offer comfort and great space utilization. The group has an unmatched leadership that has always led the company towards newer challenges. Each year the company scales taller heights in terms of not only the volume of construction but also the standard of its creations. The group has always crafted projects that have gone on to prove its focus in quality.